Not to get too biology class on you, but as you know, the skin is by far the body's largest organ. So it goes without saying that protecting it and treating it well is of the utmost importance, which is exactly why we should be thinking about what it comes in contact with every day—like our clothing. And in case you've ever wondered what the worst fabric for skin is, hear us out. While it's admittedly tricky to avoid every fabric that science deems bad your skin, informing yourself on the dangers of certain textiles can lead to wiser decisions about how often you choose to purchase and wear harmful fabrics. There's something to be said for the "ignorance is bliss" mindset, but when it comes to small sartorial tweaks that could greatly improve the health of your skin and body, knowledge is undoubtedly the way to go. To make it a bit easier for you, we did the dirty work and dug through the depths of the internet to provide you with the skin-saving information you need. Keep scrolling to find out the worst fabrics for your skin, and shop stylish pieces made of fabrics that are, alternatively, good for your precious skin. When you think of bamboo, a buttery-soft, fluid fabric probably comes to mind, but in reality, that's not the how it's found in nature. In its natural state, bamboo is stiff and rough. According to research conducted by sustainable outdoor clothing brand Patagonia, the process to convert bamboo to its softest state (rayon fiber) releases toxic chemicals (carbon disulfide, sodium hydroxide, and sulfuric acid—eek!) that are actually reproductive hazards. As anyone with dry or itchy skin issues will tell you, certain fabrics exacerbate the problem. One of the biggest culprits is one that's found in nature—wool (not to be confused with the softer merino wool). Live Science says that wearing wool can trigger eczema flare-ups, and a Mayo Clinic doctor, Megan Johnston Flanders, MD, says that the fabric can even irritate normal skin. This is the category that holds the majority of the skin-harming culprits. Man-made fabrics like acrylic, polyester, rayon, acetate, and nylon are treated with thousands of harmful toxic chemicals during production, according to ScienceDaily. They reported on a study from Stockholm University, in which researchers chose four groups of substances related to health risks and tested them for "occurrence, quantity, toxicity, and how easily they may penetrate the skin." The highest concentrations of two of the substances were found in none other that polyester. Toxic chemicals aside, synthetic fabrics simply don't breathe, and anyone who's worn polyester on a hot summer day is probably well aware of that. The fabric also traps odors, which Popular Science explained in an article. Not to go into too much gory detail, but skin germs found in sweat feast on chemicals, which synthetic fibers can't absorb, therefore creating an environment for smelly bacteria to grow. All signs point to polyester being the number one worst fabric for skin. Any fabric made to be wrinkle-resistant (even non-synthetic ones) get their wrinkle-free powers from a hazardous chemical called formaldehyde. ScienceDaily reported that greener methods are being investigated, but in the meantime, if you're tempted to purchase an item based on this quality, we suggest sticking with natural fabrics and grabbing the steamer instead. The reason that vintage clothing can be harmful to skin is simple. According to Dr. Ava Shamban of Everyday Health, "Old fabrics and furs that have not been cleaned properly or not been stored in a dust-free garment bag can harbor years' worth of dust and dander that can really raise a rash." Do yourself a favor, and get your newly acquired vintage piece thoroughly cleaned before wearing. By process of elimination, you've probably already guessed that the best fabrics for your skin are natural ones. These include cotton (especially organic), merino wool (which is softer than wool, thanks to finer fibers), cashmere, hemp, silk, alpaca, and linen. If skin health is a concern of yours, we hope this will encourage you to be more mindful of the materials your clothes are made of. 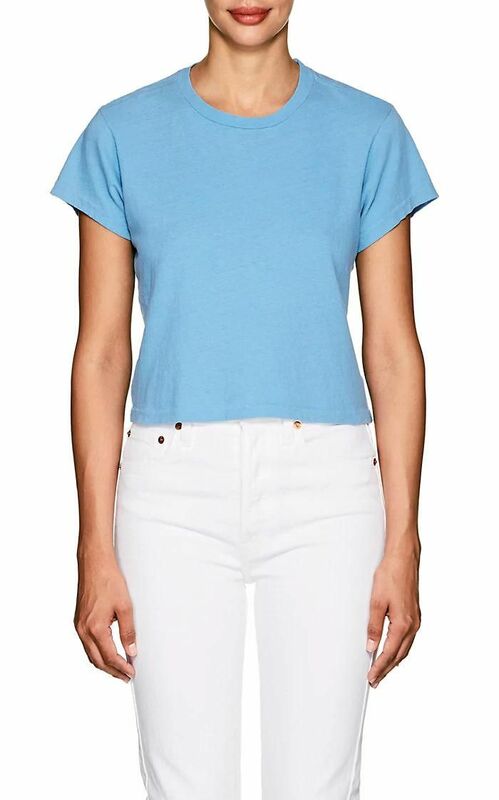 These soft cotton tees are an editor favorite. And now, here's the perfect breezy vacation dress. It doesn't get more timeless than this. This pretty 100%-silk top is a best seller. A linen dress (like this one) plus flat sandals are the ideal summer outfit combination. These 100% cotton jeans give a vintage look without the hassle. These scientific facts are more than enough to make us check the clothing label for the fabric specifications before we buy. HBU?